Are you looking for the best razors for men on the market? Finding a good men’s razor can prove difficult, which is why we tested the top shaving razors from the leading brands, including Gillette, Schick, Merkur, Dorco, Parker and Vikings Blade. Whether you’re shaving your beard, head or chest, all men know that a good shave requires a high-quality razor, especially if you have sensitive skin. The best razors can sculpt and groom your facial hair, providing a smooth experience free of cuts, bumps and skin irritation. As you might have expected, a high-end razor for shaving offers guys the best and closest shave. 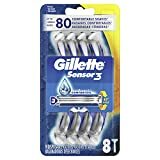 If you want a well-reviewed cartridge or disposable razor, the Dorco Pace 6 Plus, Gillette Mach3, Gillette Fusion ProGlide, and Schick Hydro 5 are excellent. For a safety razor, you can’t do better than a Merkur or Vikings Blade, although a Weishi is a solid budget buy. Ultimately, the best shave of your life is right at your fingertips and any of these options will give you a smooth cut. But much like choosing the perfect men’s hairstyle, picking the right razor for your face involves making a few important decisions before getting that close shave. After learning about the different types of razors and the pros and cons of each, check out our reviews of the best razors on the market to find the right product for your needs! 2.2 What’s Your Everyday Shaving Routine? This German brand needs no introduction as it is one of the premier razor companies in the world. The Merkur Classic Double-Edge Safety Razor is perfect for those who enjoy expert grooming tools, and its features are designed for those who are getting accustomed to the intense shave of a straight razor. Despite its single-blade (on each side) design, this razor caters to those with sensitive skin through impeccable blade alignment. The handle’s pattern provides ample grip, and the blade isn’t as intense as the other Merkur safety razor model on our list. This three-piece razor is easy to clean and provides a seamless shaving experience. You really can’t go wrong buying this popular choice – this men’s razor has everything you need and more for getting started with a classic experience. And for guys who want a more compact, short-handle 2-piece double-edge safety razor, consider this other Merkur option. Dorco is not a widely-known men’s grooming company, but this review may change that. Fans of the Dollar Shave Club may recognize the Pace 6 Plus. That’s because Dorco is the manufacturer of DSC’s razors; the company just rebrands Dorco’s products as their own and then marks up the price! This razor contains six blades, which means you spend less time in front of the mirror. The Pace 6 Plus also features a tilting head for added precision, and a lubricating strip with lavender oil for instant skin hydration. For not much more than $20, you won’t find a cleaner, faster shave. This price tag also includes 10 cartridge refills, making the package an excellent value! 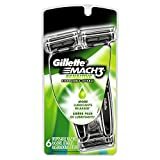 Gillette is at the forefront of the shaving world, and it’s no surprise that the Mach3 Turbo lands at the top of this list. If you are looking for a high-quality disposable razor, you have met your match. The Mach3 Turbo will cost you a little less than $10, and its advanced features reveal why this disposable razor costs more than other brands. The Mach3 Turbo is designed to get as close to the hair follicle as possible, giving you a clean shave every single time. The blades are sharper than other disposable competitors, and this razor results in less skin irritation. The Lubrastrip soothes your skin as the razor passes over your skin, and when it fades to white, you know to change the blade. This razor offers a ton of shaving power for the price, and it’s perfect for anyone looking for a quality product they can reuse. 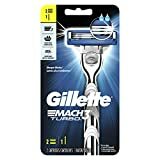 And if you need a razor for sensitive skin, the Gillette Mach3 Disposable model has been specially designed to minimize irritation for all skin types! 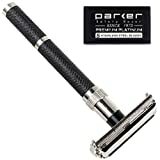 Like Merkur, Parker is another popular and well-known razor company. The brand’s 96R Long Handle Butterfly Double Edge Safety Razor is one of a kind and certainly deserves to be near the top of our list of best razors. The textured handle offers an incredible grip, even when your hands are wet, and the chrome blades are surgically-sharp for a close shave every time. For starters, you can feel the razor’s quality by the brass frame, providing a heavy feeling that this model is built to last. The fact that this safety razor feels heavy in your handle actually allows you to cut through facial hair easier for a cleaner, smoother shave. This unit comes ready with 5 high-quality blades that won’t dull on you quickly. The super sharp razor blades are also precisely manufactured to prevent nicks, cuts, skin irritation, or razor burn. If you’re looking for an exceptional razor with some of the highest customer ratings in the industry, then look no further. Combined with a solid shaving cream, the Parker 96R delivers the ultimate shaving experience. Gillette is obviously one of the best razor brands men can buy. The Fusion ProGlide Power is a powerhouse in the cartridge razor category. For around $13, you can get an extremely clean shave, quickly. This model comes with FlexBall technology, which provides thinner blades for less irritation and closer results. You are given the option of battery-powered micro pulses that take your shaving precision to the next level with a seamless glide. The Proglide Power even takes care of pesky stubble with microcomb technology. The blades on this razor are surprisingly precise, and the lubrastrip provides an even stronger barrier against skin irritation. With five blades and a separate blade for edging, those replacements can start to add up. Nonetheless, this razor is powerful enough to look past any extra costs that comes with time. 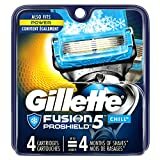 For a cheaper version with equally great results, guys can also check out the Fusion5 ProGlide. Schick is another company that can’t be beat when it comes to good razors. The Hydro 5 Power Select Razor contains five blades that work against irritation while achieving a clean, close shave. This razor offers a variety of settings to match your shaving preference, and the innovative gel reservoir keeps your face hydrated long after your morning shave is over. This disposable razor comes with a price tag that is remarkably affordable for its advanced features. The Hydro 5 makes the smoothness of your skin a priority, and even includes a flip-trimmer so you can reach every inch of hair. Don’t count a disposable razor out — the Hydro 5 has proven to be one of the best men’s razors available! And for men with sensitive skin, the Hydro 5 Sensitive disposable razor is dermatologist-tested and approved to protect all skin types! A straight razor is the best way to obtain the cleanest shave possible, and the Feather SS Japanese Straight Razor doesn’t disappoint. This razor’s blades are some of the sharpest in the entire grooming industry. They are easily replaceable, simply pinch the old one to remove and replace it with a fresh blade. The stainless steel design of this razor is timeless, and the silicon resin handle is easy to grip and heat-resistant. Although this razor may seem intimidating to straight razor newbies, it’s extremely user-friendly design allows any man to get the cleanest shave imaginable. The rounded shaving head provides you with control, and you can get a modern shave in a flash. The Feather SS will set you back around $50, and this quality grooming tool is worth every single penny! Vikings Blade is another highly-rated brand in the men’s grooming market. The company’s Chieftain Safety Razor looks absolutely beautiful with a shiny chromed-out finish and comes in a luxurious carry case complete with a mirror. As a razor dedicated to rendering a close, smooth shave without irritation, the product’s blades are nothing short of premium. Forged out of high-end Swedish metal, the platinum-coated blades will cut through thick facial hair just as easily as short stubble. And with a heavier build that is surprisingly well-balanced, guys won’t have a problem handling this tool as they glide across their face. Moreover, the handle is ridged in multiple areas to comfortably fit in your hand. 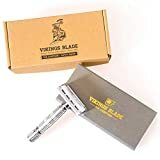 If you’re looking to take your wet shave to the next level and need a world-class product to help you get there, Vikings Blade is the men’s safety razor you need! The Merkur Futur is bringing out the big guns. This intricate and seamless adjustable safety razor comes from Germany, and it’s crafted to perfect a man’s most elegant shave. Not only is the Futur’s appearance sleek, but it can handle even the most burly of beards. It has six settings that allow you to customize your shave, from slight stubble to facial hair that would make a lumberjack proud. This adjustable double-edge safety razor also allows experienced users the ability to experiment with how aggressive of a shave they want. This razor would have definitely taken the top spot if it wasn’t so pricey for most guys. Plus, beginners should be aware of its heavy design and super sharp blade. You may need to go slow if you are a safety razor novice, but the Futur can conquer even the most untamed facial territory. Priced for the premium, luxury experience and quality you get, it’s an all-in-one shaving tool! 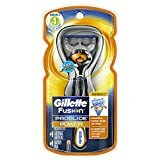 With so many factors to consider and razors for men to choose from, guys may find it overwhelming to research and review all the products out there. So before we jump into discussing the best shaving razor and blades, here are a few things to keep in mind when shopping around. Purchasing a new men’s razor becomes complicated when you consider all of the varieties available, but knowing their distinct purpose can make personal grooming a lot easier. There are four main types of razors available: safety, cartridge, straight, and disposable. Cartridge razors are extremely convenient, but vary in quality depending on the brand. You buy the cartridges of razors separately and replace them when the blade becomes dull. Constantly replacing the razor cartridge (e.g. blades) may become costly over time, especially if you prefer the closest shave possible without nicks and cuts. Disposable razors offer a cheap shave for those who aren’t interested in investing in a more expensive or high-quality option. The blade and handle are one piece, and this razor is thrown away once it gets too dull for proper use. This is an affordable way to get a decent shave, but your skin may suffer the consequences. Safety razors are popular, as they only have the end of the blade exposed to avoid unnecessary cuts to the skin. 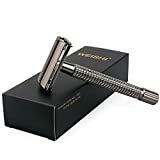 The double-edged safety razor is favored by beginners and experienced shavers for its ease of use, but the blade is kept at a restricted angle, making its versatility rather limited as a precise tool. Straight razors are for obtaining the most precise, classic shave possible. This kind of razor is dangerous to use for beginners, since it is easy to cut or nick your face using this tool. The straight razor has been used for centuries, but even the most seasoned of shavers should approach this shaving tool with caution! Practice makes for the perfect shave with this type of razor. What’s Your Everyday Shaving Routine? Guy’s haircuts vary greatly, and your facial hair may take just as much time to perfect. Before you decide on a type of razor, take a look at your daily shaving routine. If you’d like to make your morning routine fast with just a few swipes, choose a cartridge or disposable razor for a quick, clean shave. Safety and straight razors are better for guys who like to take their time. Those with sensitive skin may not want to reach for a disposable razor, which can be harsh on your face. A multi-blade cartridge razor can lead to excessive skin removal and increased irritation and bumps. Reach for a safety razor for a close shave without too much wear and tear on your skin, or a cartridge razor with lubricating strips attached to soothe your face and effectively remove stubble. With that being said, a quality shaving cream can go a long way. In fact, we’ve found that the best shaving creams absolutely enhance the experience, resulting in a close shave without drying your face out or irritating your skin. For example, Taylor of Old Bond Street’s Sandalwood Shave Cream actually prepares your beard for shaving and moisturizes your face in the process. A man’s main focus is usually on the quality of the blade, but a razor’s handle holds equal importance. Make sure it has good grip to decrease the likelihood of a slip that could injure your face or ruin your beard design. Your price range will determine your razor’s level of precision and quality. Buying a pack of cheap BiC disposables may get the job done, but investing in a better model will give you the ideal results. While the best razors aren’t cheap, they are certainly affordable. Remember, the top products in the market are built to last, so consider your purchase a long-term investment in taking care of yourself well. The world of grooming tools definitely evolved this year. These men’s razor reviews reveal that there is a product for everyone! So no matter if you like a thick, groomed beard or a clean-shaven face, these are the best razors to do the job. And if you don’t want to shave your beard completely and think you’d prefer to leave just a bit of facial hair, check out these awesome stubble beard trimmers.